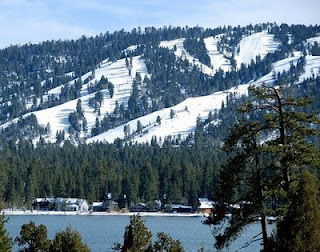 Well, we survived the trip to Big Bear! So, this was going to be the first getaway weekend for David and I since we got married (and, yes, after a year together in our small apartment, I am willing to categorize two days on top of a mountain on a work retreat with my husband's company as a "getaway weekend"). I'd been anticipating the trip for weeks. "We are going to take Snoods up to the snow!' I kept telling friends and family excitedly. David and I spent nights in the busy weeks that preceded the trip imagining life in the cabin: Playing in the winter wonderland! Romantic moments spent sipping cocktails and snuggling by the fire! Catching up on our reading as snow fell gently upon the windowpanes! The trip began with a few hiccups. It took stops at what seemed like every PepBoys in the greater Los Angeles area to finally find chains to fit our tires and by the time we finally got on the road traffic was a mess on the freeway. But, after four hours of effort we finally arrived! Let the fun begin! We threw our bags down and headed straight for the backyard, delighted to be glimpsing the icicles and tall drifts of snow that covered the landscape for as far as the eye could see - thrilled to be about to experience our child's first moments of snowy-good-times!! We had ventured about six feet out the back door when David and I looked at each other, having had a simultaneous revelation. There really is no practical way to "play" with a five-month-old baby in the snow. I mean, he can't stand, he can't sit up and he starts crying whenever anything cold touches him. So the possibilities were pretty limited. David and I just sort of stood there holding him and looking at each other like, "What now?" Yes, that is my husband sledding down a hill with our child strapped to him in a Baby Bjorn. At this juncture, you likely have a phone in hand - poised to contact the appropriate authorities about the many questionable parenting choices being made in this photograph. You: Shouldn't you have a hat on that kid? Me: I did purchase a hat for him. But, because he insisted on tearing said hat from his head like a rabid wolverine whenever I attempted to put it on, I chose the path of least resistance and let him roll hat-free. You: Shouldn't you have some mittens on that kid? Me: While I admit that perhaps his cute and tiny digits should be covered I must tell you -- I tried pretty hard to find him some gloves, but I couldn't. You: Really, shouldn't you have some more clothes on that kid? Me: Despite all the snow pictured it wasn't all that cold out. I swear. 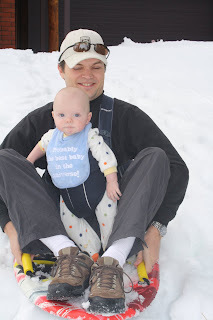 You: Is sledding with a 5-month-old really that good an idea? Me: In my defense, the sled was capable of reaching a maximum speed of approximately 0.05 mph. Me: Also, it was my husband's idea. In total our "playing in the snow" fun-time lasted exactly 7 minutes. After one run down the hill with a barely moving sled we gave up and headed inside, where we let Snoods roll around on the floor - just like his likes to do at home. A similar fate awaited the rest of our wintertastic plans. As evening descended, dreams of cocktails and cuddling faded as David unpacked, while I got started on Snood's nighttime feeding/bath/bedtime ritual. By the time we had registered his many Pack-and-Play related complaints and finally got him down, I was so exhausted that I went to bed at 8:30pm after wolfing down some dinner and barely registering the fire. David spent the rest of the evening watching episodes of 'SpongeBob Squarepants' with a co-worker's 6-year-old. The next day we managed to catch up on exactly no reading. Instead we got up, changed the baby, fed the baby, took the baby for a walk, played with the baby, fed the baby...and so on. In other words, we had the exact same day we would have had back at home - only 7,000 feet higher and in a less comfortable bed. My husband's good friend told him this week "I really enjoy your wife's blog. It has definitely convinced me not to have children for a while!" I fear this entry will do little to change his mind. Yes, I missed the romance, the cocktails and the crackling fires. Sure, I longed for the days of leisurely drives playing music that didn't involve cartoon voices and the tinny synthesizers of Baby Mozart. OK, I did briefly pine for those days of reading in front of the fire from books that did not involve firetrucks or cartoon hippos. And yet, driving down the mountain at the end of our weekend, I looked back at all the expectations unmet and could honestly say that I would trade them all again for this moment, snuggling in the snow with my Snood. That being said, let's not get crazy! Next time we get away for the weekend he's staying with the in-laws and I'm going hog-wild on the cocktails, people.